Some skeptics of energy efficiency claim that energy efficiency never really avoids the need for new power plants. They claim that energy efficiency might reduce our energy consumption in theory, but not in practice. Well, the good news is that there’s new evidence from the California Public Utilities Commission showing that energy efficiency is actually displacing the need to build power plants. So much power is being saved, in fact, that California is embarking on a historic path: Instead of increasing the total amount of electricity we use, which has been the general trend since Edison’s time, energy efficiency will reduce the total demand for electricity. (This efficiency will also provide a significant boost to economic growth, I might add.) 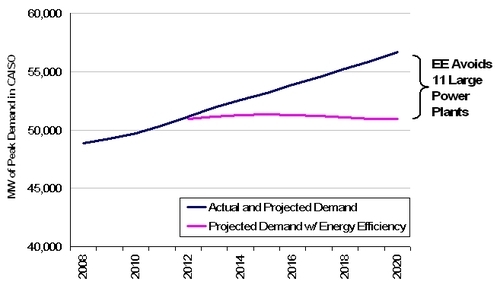 In the graphic below, you can see that energy efficiency is actually bending the demand curve downward. California is in the process of determining how many power plants it should allow private utilities to build over the next decade. The Public Utilities Commission analyzes how much energy California is expected to consume over the next decade, and then determines how many power plants must be built in order to provide that energy. The Commission is still in the process of making a final decision, but in the meantime, two fascinating results have emerged from the Commission’s analysis. First, energy efficiency will be relied upon to replace over 11 giant dirty power plants. (That doesn’t even include all the power plants avoided due to previous programs.) These savings will be coming from the energy efficiency programs, building codes, and appliance standards that allow us to get improved energy services for less energy. For example, over the next ten years you might replace your air conditioner with the most efficient air conditioner on the market instead of an average one. Well, the energy saved from that high efficiency air conditioner, along with the energy saved from all the other energy efficient air conditioners, along with the energy saved from efficiency improvements in other appliances and buildings, all add up to large amounts electricity that we don’t need to produce. In the aggregate, this means Californians can avoid whole power plants worth of energy. In this case, over 11 giant dirty power plants. The second impressive finding in the Commission’s analysis is that energy efficiency will be accomplishing a truly remarkable feat over the next decade: It will actually stop the historic growth of electricity consumption. For years, California has led the nation in stemming the growth of electricity consumption per capita. Californians today consume the same amount of electricity per capita that they consumed in 1975! Meanwhile, the rest of the country has increased its per capita electricity consumption over 50%. This is one hallmark of California’s leadership in energy efficiency. For state-to-state comparisons, you want to control for population changes, which is why those statistics are measured per person. However, in planning for power plants, you want to measure absolute electricity consumption. Even though consumption per person has been flat, total electricity consumption in California has increased due to population growth. This historic trend is about to be reversed: energy efficiency is displacing so much electricity, that we will actually be stopping the growth in electricity demand. Historically, the Energy Commission shows that our demand for electricity grew at an average rate of 1.44% per year. Using a similar growth rate, and not including new energy efficiency programs, the Public Utilities Commission projects a total of 10.8 % growth in electricity demand between now and 2020. However, if you include all the savings from our strong energy efficiency programs, codes, and standards, there is zero growth in electricity demand. (Incorporating the effects of our strong energy efficiency policies actually shows slightly decreasing consumption, an annual growth of -0.04%.) There is no mistaking what is happening here: energy efficiency is leveling the demand curve, in absolute terms, marking a historical achievement. Over the last 40 years, California has led the nation in energy efficiency by leveling its energy consumption per capita. Now, with even stronger energy efficiency policies, California is taking it to the next level: leveling its demand curve. http://www.energy.ca.gov/2009publications/CEC-200-2009-012/index.html. It should be noted that this graph covers demand from the CAISO balancing authority, which excludes some publicly-owned utilities’ balancing authorities within California state limits. However, CAISO covers about 80% of statewide peak demand. Id. Furthermore, the CPUC assumes that POUs will be contributing a proportionate amount of energy savings relative to the IOUs, so it is reasonable to assume that they will also be contributing a proportionate amount of demand savings. See CPUC, Revised Scoping Memo Assumptions, Technical Attachment Spreadsheet, Load for RPS Calculation, fn 43 (2011). A giant conventional power plant is assumed to be 500 MW in size. New energy efficiency programs over the planning horizon will contribute 5,687 MW of demand, yielding the equivalent of 11.4 giant power plants. Even this estimate is conservative because it doesn’t include all the efficiency coming from publicly owned utilities outside of CAISO jurisdiction, which are omitted here for simplification. In fact, Californians consume slightly less electricity today, 6,719 kWh/person, than they did in 1975, which was 6,891 kWh/person. The rest of the country has increased that consumption by 57% since 1975, now at 12,890 kWh/person. EIA, State Energy Database System (2011); EIA, Form 826 Monthly Utility Data (2011). Available at: http://205.254.135.24/state/seds/seds-data-complete.cfm. Although California’s total electricity use has grown at slower rate than the rest of the U.S.
 A 10.8% growth over the entire 8 year period yields a 1.3% annual growth rate. Demand starts at 51,129 MW in 2012 and grows to 56,658 MW by 2020. Supra note 1.